There is No Wrong Way to Knit - Say It, "Rah-shay"
Or…you do that knit-fu that you do so well. After several attempts to learn to knit, I finally found a way that worked for me. Way back when, while attending one of my fiber group meetups, a woman looked at the way I was holding my needles and I announced that “I was knitting wrong.” She went on a whole diatribe about the way I was holding my yarn, HOW my stitches looked, what could happen if I made a mistake and so forth. I can remember feeling so beat down after this statement. See, the woman who taught me to knit showed me a way in which I don’t wrap my yarn but it’s not quite continental yet it gets the job done. For a good while I felt so self conscious about this statement and even avoided attending the group for a while. After a while I stopped worrying about what others were saying/thinking about my knitting and kept on keeping on. 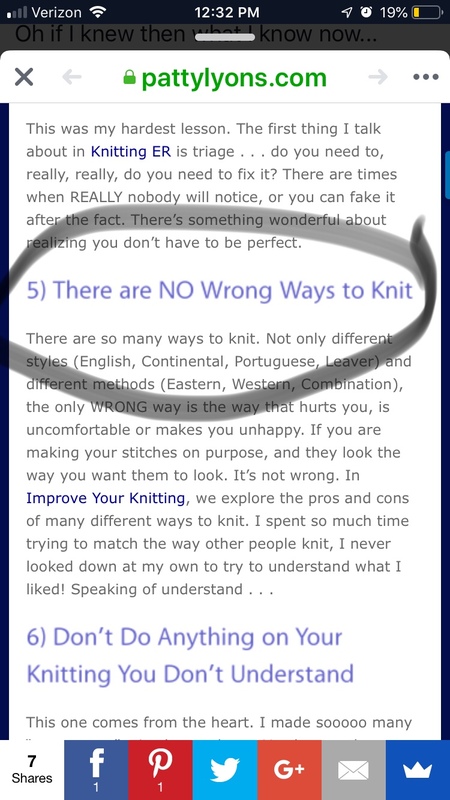 When I shared the story with a knitting friend, she tsked and told me that there is no “wrong way” to knit especially if the finished object comes out like it is supposed to. Knitting has been a joy and pleasure for me and one word from a stranger almost derailed me. One of my crafting goals for myself is to approach knitting with openness and enjoyment and focus on the process instead of the what I complete. The picture below is from Patty Lyons and her tips are fantastic. Yes. There are rules and norms to follow but there is also space to learn and grow and should and could be done without judgement. So enjoy your stitches and keep on keeping on. Rachee, for years people told me I knit wrong. I finally met Stephanie Pearl-McPhee and she instantly knew where the woman who taught me to knit was from. No, I was not knitting wrong, I was knitting like a Highland shepherdess on circular needles! Meh, I say to the knitting police. No wrong way!! Just enjoy your knitting, and know there are many ways to get to the same place. Knit on!